Fibre5 is a balanced blend of soluble and insoluble fibres that gives you more than five grams of fibre per serving and features five key ingredients, including probiotic bacteria. Lightly flavoured, Fibre5 is a smooth powder that mixes easily with a full glass of liquid, such as water or your favourite beverage along with a Neways liquiceutical. The common denominator is five: the five key ingredients and five grams of fibre bring you Fibre5. 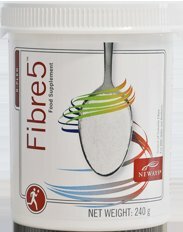 The ingredients in Fibre5 support intestinal tract function and waste removal. This supplement also supports regularity, colon health, gastrointestinal health, and normal digestion. So eat right, drink more water, and work on being fibre fit with Fibre5. Mix two level scoops of Fibre5 with a full glass of water or juice. Stir briskly and drink promptly. If mixture thickens, add more liquid and stir. Take daily with plenty of water. Psyllium husk, inulin, cellulose, acidity regulator:citric acid, guar gum, maltodextrin, anti-caking agents: (gum arabic, silicon dioxide), orange flavour, yuzu flavour, Bacillus coagulans GBI-30 6086, modified starch: starch sodium octenylsuccinate, sweetener: sucralose, corn starch, beta-carotene, cucumber flavour, corn oil, antioxidants: (dl-alpha tocopherol, ascorbic acid), Glucosamine HCl, Capsule Shell: Pullulan, Rice Flour, Green Tea Powdered Extract, Turmeric Powdered Extract.